Griffin Theatre Company presents The World Premiere of A RABBIT FOR KIM JONG-IL, by Kit Brookman, at the SBW Theatre, Kings Cross. 10 Oct -21 Nov. This play is not a true story, but it is inspired by one. 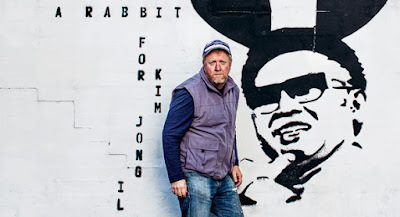 In 2006, In Germany, a breeder of giant rabbits was approached by the North Korean government to acquire a number of his rabbits, ostensibly for a breeding program to be set up in North Korea. No one quite knows what happened next, except that his invitation to go to North Korea to oversee the creation of a rabbit-breeding program was abruptly cancelled without explanation. … This play does not aim to be a naturalistic representation of the events that inspired it, or of the true situation in recent times in North Korea ... It is a fable about guilt and forgiveness, about the things we are willing to ignore in order to succeed, and the price we pay for having ignored them when we do. Ms Lewis, in her notes, poses some contemporaneously (and eternally?) pertinent and provocative questions, ideas, issues for contemplation, as does Mr Brookman in the last sentence of his above quote. So, it is baffling then, that none of that is at all an obvious context for discussion after this production of A RABBIT FOR KIM JONG-IL. None of the above philosophic musings, longings, of Mr Brookman and Ms Lewis, occurred to us - I was, mostly, in a state of shock and like my friends, bemused - We spoke of whether we had missed the play's reason for being selected and shown. Was there something going on other than the literal? Were we 'dummies'? We had been promised in the promotional material, "a cunning and comic thriller [...] a pointed parable about betrayal and forgiveness, greed and regret". The play, we had been told in pre-show interviews, began as a dinner table anecdote (discussion? ), and that the two principal artists working alongside each other for many years determined to realise it. I wondered whether the two central creatives had had enough objective viewpoints added to their passion around this work, for them to be able to see what was on the page, and then what was on the stage? Who else advised them, in this process? Were they too intimately connected to it to see what was not clear, what was not being communicated? For if the play were 'comic' it definitely needed to be funnier. And if it were a 'thriller' - from my Macquarie dictionary: a book, play, or film, dealing with crime, mystery, etc., in an exciting or sensational manner - it needed more excitement and sensation. Both the comedy and the thriller aspect, that may be there, needed to be faster, and heavens, less, less sentimental in its tone, especially over our animal anthropomorphistic affectations - OMG: two cuddly, bunny-ears worn by a 'cute' smiling and animated Mr Brookman (remember James Stewart and his Harvey! ), and even more alarmingly, the ultimate appearance of a real, really real, (frightened) ginger rabbit, oooohh! - so that we would have had less time, perhaps no time at all, to observe the preposterous lack of judgement of what is dramaturgically comic or logically acceptable or consistent to character or emotionally over-the-top etc. The pacing and style of the performance just gave us too much time/space to question the whole enterprise, while it was happening. That the meta-heroic acting energies - imaginative (especially imaginative) and physical - on the parts of Steve Rogers (Johann Wertheim) and Kate Box (Sofie Amsel) were of no avail to keep this wearying conception afloat, and marks a tragedy of an enormous kind and worth noting, for Mr Rogers' and Ms Box's presence are usually insurance, and ensurance, of a good night in the theatre. But, when balanced against the relatively, one dimensional creations of Meme Thorne (Park Chun-Hei) and Kaeng Chan (Chung Dae-Hyun), with the added burden of a soporifically weighted sentimental reading of the surreal rabbit, Felix, by Mr Brookman ( the author, himself), even they couldn't bedazzle us long enough to produce a magic trick, a miracle, for our involvement. When Park told Wertheim: "... it's time for you to go home." I was thrilled. When Wertheim stated: "I want to go home." I concurred. Park: "It's time to go." Wertheim: "Time to go." Kevin: "Thank the Lord." And that final offer of the Writer and the Director, of pulling, literally, a rabbit out of a box (hat) was not enough to win me over. "What were they drinking at that dinner party? ", I queried, my companion. Of course: Go see for yourself. I mean, I was impressed by Mr Brookman's play, SMALL AND TIRED - I became a fan. Ms Lewis' production of THE BLEEDING TREE, I reckon, one of the best productions of this year's offers in Sydney - I am a fan. In fact, my double 'fandom' was part of my excited anticipation to see A RABBIT FOR KIM JONG-IL, by Mr Brookman and Ms Lewis. Well, the title, is fairly intriguing, don't you think? I wonder what the North Korean's have thought of it? Remember Seth Rogen's 2014, THE INTERVIEW and the North Korean attention it attracted? I went home and pulled out TEAM AMERICA: WORLD POLICE (2004) to get my North Korean comic thrill fix, after this disappointing new play. Not a thought about guilt, betrayal, greed or regret, struck me at either viewing. Hey KJ what about Ivanov? I saw it with a group of trusted friends last week and we were as a whole thankful Belvoir didn't disappoint like they have a lot this year. i find your reviews frank and honest. There is really something badly amiss in Sydney and Aust tbeatre at the moment. I think this ceaseless nepotism and gentrification of the theatre by the petite bourgsoise and their artist agents is leading to a theatre steeped in introspective sentimentalism the is fearful of offending. The middle class sentimentality would deal with 'feelings' and interpersonal relationships rather than the broader and stronger themes that a play about the struggle of living in a dictatorship would allow. Apt decriptors for aust theatre at the moment would be theatre of the cowards in which real meaningful discourse is avoided and surplanted by sentimentally and concerns for feelings and interpersonal relations. its petite bougsoirse faire at its highest.